May 29, 2011 - Friends of the Earth, a leading advocate for a healthier environment, sent a notice of intent to sue the Environmental Protection Agency on Thursday regarding its failure to respond to a 2006 petition asking for the regulation of lead emissions from general aviation aircraft under the Clean Air Act. The petition specifically asked the EPA to find that lead emissions from aircraft using leaded aviation gasoline (avgas) may endanger public health. Nearly five years later, despite continuing to acknowledge that there is no safe threshold for lead exposure, the EPA has taken no final action with regard to Friends of the Earth?s petition. ?The EPA has repeatedly concluded that lead is extremely toxic to humans, wildlife and the environment and causes a variety of health effects even at low doses,? said Marcie Keever, legal director for Friends of the Earth. ?Our letter puts the EPA on notice that we will go to court unless EPA does what the law requires and addresses this pollution. The health of airport workers, pilots, passengers, and surrounding communities from continued exposure to lead in aviation gasoline hangs in the balance.? While lead was phased out of automobile gasoline over 15 years ago, it persists as a constituent of avgas, resulting in aviation being the single largest source of lead emissions in the U.S. and posing a significant threat to public health--especially in communities located near airports where avgas is used. 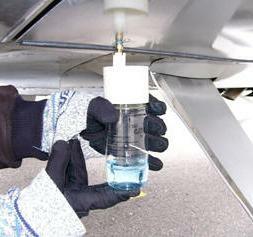 To date, the EPA has identified approximately 20,000 airports at which leaded avgas may be used. Sixteen million people reside and 3 million children attend school in close proximity to these facilities. Reinforcing the need for immediate action, in November 2010, the EPA identified 16 regions in the United States that fail to meet clean air standards for airborne lead emissions. Fifteen of these regions are in counties that contain at least one airport where lead is emitted. In addition, earlier this month, the Center for Environmental Health filed suit against major leaded aviation fuel suppliers citing excessive water and air pollution around 25 airports in California. While commercial airlines use unleaded jet fuel, general aviation aircraft using avgas account for about half of the national inventory of lead emitted to air. In total, the EPA estimates that approximately 14.6 billion gallons of leaded avgas were consumed between 1970 and 2007, emitting approximately 34,000 tons of lead. Currently 70 percent of small planes could be using unleaded fuel or a modified alternative without any additional technology. Conditions associated with lead exposure are well known to health professionals and public health officials. These include death and brain damage due to high levels of exposure, and learning disabilities, lower IQ levels, increased blood pressure, and/or nerve damage at lower exposures. Children are at higher risk than adults because they absorb larger amounts of lead and are more sensitive to lead induced toxicity. In fact, a 2005 Centers for Disease Control and Prevention study on Preventing lead poisoning in young children found that there is no safe threshold for lead exposure in children. In addition, airborne lead is an environmental pollutant that can travel far from its original source, finding its way to fields and forests and into streams and waterways. As far back as 1989 a Federal Aviation Administration document recognized ?the attractiveness of using automobile gas (autogas) in light aircraft,? stating that several common aircraft models were fully certified by the FAA to use autogas and that the cost of autogas was substantially less than avgas. It was the FAA?s expectation that as regular leaded autogas was phased out, more aircraft would be using unleaded autogas in the engines. But for decades since the EPA began regulation of lead emissions from other sources, it has excused the general aviation community. ?General aviation is unquestionably the leading source of airborne lead,? said Deborah Behles, Associate Professor and Staff Attorney at the Environmental Law & Justice Clinic at Golden Gate University School of Law. ?Taking all of the evidence together, we must address this critical health issue and start phasing out lead in aviation gas now.? Recently, members of the aviation community have come on board calling for more immediate action. A group of pilots known as the Aviation Fuel Club have started a grass-roots movement to make unleaded fuel available at airports. ?Given the EPA?s recognition of the harmful effects of lead emissions and the tremendous amount of lead emissions that still come from aircraft, we believe that the EPA will eventually take action,? said Marianne Engelman Lado, the lead Earthjustice attorney representing Friends of the Earth. ?At the same time, in the interest of public health, the EPA?s failure to take timely action on Friends of the Earth?s petition is inexcusable. We are simply asking the EPA to move more quickly in establishing regulations that would protect millions from ill health caused by the known toxic effects of lead.? Earthjustice and the Environmental Law and Justice Clinic at Golden Gate University School of Law are representing Friends of the Earth in this challenge of the EPA?s failure to respond to Friends of the Earth?s 2006 petition.